President of the Republic of Cyprus, Demetris Christofias, has said that Turkey is following an expansionist foreign policy in the region and described Ankara’s attitude as arrogant which could one day be turned against Turkey herself. Speaking at the Annual Gala of the Cyprus Federation of America in New York, President Christofias referred to the recent Turkish aggression in the Mediterranean against Cyprus’ sovereign right to explore and exploit its natural resources in its Exclusive Economic Zone (EEZ). “As an economic power, and a political and military power, Turkey cannot control herself. Her foreign policy is described by arrogance and cynicism which I think that at the end of the day will turn against her. When you have the power and you don’t know how to handle it, you may eventually damage yourself” the President stressed. Commenting on Turkish Prime Minister’s Recep Tayyip Erdogan’s speech at the UN General Assembly he said that Erdogan criticized Israel for not respecting UN resolutions for the Palestinians. The President pointed out that Turkey continues to violate a series of UN Security Council resolutions on Cyprus, which denounce the Turkish occupation of Cyprus’ northern territory, the declaration of the so called state in the Turkish occupied areas of Cyprus as well as the violation of human rights. Regarding Turkey’s threats against Cyprus, which began exploration drilling for natural gas in its EEZ, President Christofias stressed that the UNSC, as well as its five permanent member states separately, have defended the right of the Republic of Cyprus to explore its Exclusive Economic Zone for hydrocarbon reserves. He also denounced the illegal agreement signed between Turkey and the Turkish Cypriot regime in occupied Cyprus to delineate what it calls continental shelf. The Cypriot President reiterated that Turkish Cypriots, beeing equal citizens of the Republic of Cyprus like their compatriots the Greek Cypriots, will also benefit from any wealth found in Cyprus’ EEZ. Furthermore, President Christofias thanked the Greek government for its support towards Cyprus stressing that relations between Cyprus and Greece are longstanding and despite the financial problems faced in Greece, the government in Athens always places the Cyprus issue as its priority. During the Gala Dinner, the Cyprus Federation of America honored Maryland Senator Ben Cardin for his long standing support towards Greece and Cyprus in the US Congress. His predecessor Senator Paul Sarbanes made the presentation. 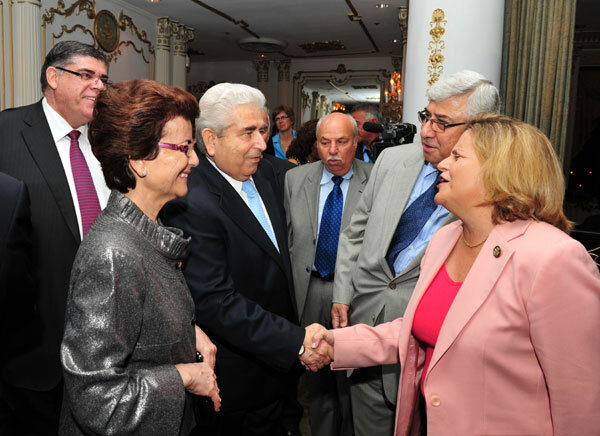 President Christofias congratulated the US Senator and thanked all other US politicians who addressed the Gala expressing their support towards Cyprus. He paid special tribute to the efforts of the Cyprus Federation and the Cypriots of America for staying united and fighting for Cyprus. Ambassador Vassilis Kaskarelis conveying to president Christofias the greetings of Prime Minister Papandreou and Foreign Minister Lambrinidis, stressed the support and solidarity of Greece for Cyprus. CFA President Peter Papanicolaou praised Christofias for his efforts to solve Cyprus problem. “As Cyprus is going through hard time, we assure him that Cypriot American Community stands by his side”, he said. PSEKA president Philip Christopher praised Senator Cardin for being there for Greece and Cyprus on every resolution, but also for his leadership at the Helsinki Commission. Christopher pointed out that a solution of the Cyprus problem must guarantee the removal of all Turkish troops, the return of the refugees to their homes, the restoration in Cyprus od Human rights for all citizens, the same rights every EU member citizen enjoys. “I don’t care how you may call the solution as long as it respects all the above”, he said. Christopher finally praised Christofias for his courage to confiscate the Iranian arms shipment. 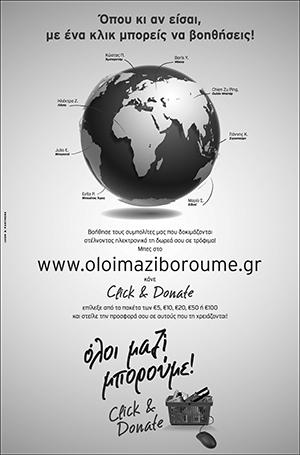 George Tsunis who was the event’s chairman called on everybody not to forget Cyprus. 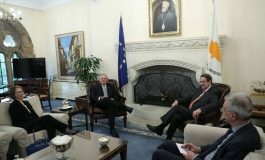 He praised the leadership of the Cyprus Federation and PSEKA for their tireless efforts to keep the issue alive in Washington, pushing hard with the administration and Congress. Chairwoman of the Foreign Affairs Committee Iliana –Ros-Lehtinen asked US administration to be careful in the appointment of the next US ambassador to Nicosia. She also criticized sharply Turky for the continuing occupation of Cyprus and the recent threats. Archbishop Demetrios told the audience that Cyprus has become a testing place of the Western ideals and principles. Turkey violates them for 37 years. He praised also President Christofias for his humanity and compassion. The event’s MC was Andy Manatos. Also present at the event were, Foreign Minister Erato Markoullis, Cyprus Government Spokesman Stefanos Stefanou, Ambassadors Minas Hajjimichael and Pavlos Anastasiades, Congressman Mike Grimm, State Senator Michael Gianaris, State Assembywoman Nicole Malliotakis, Metropolitan Evangelos of New Jersey, Cnsul Generals of Greece and Cyprus Aghi Balta and Koula Sofianou, AHEPA Supreme President John Grossomanides, the Presidents of the Hellenic Federations of New York and New Jersey Elias Tsekerides and Tasso Efstratiades etc. Cyprus President Demetris Christofias has briefed the five permanent members of the UN Security Council on the progress of the UN – led Cyprus negotiations to reach a solution of the Cyprus problem as well as on the Turkish threats in response to moves by the Republic of Cyprus to proceed with exploratory drilling for natural gas or oil in its Exclusive Economic Zone (EEZ). President Christofias hosted Friday in New York a luncheon for the five permanent members of the UN Security Council, which was also attended by Minister of Foreign Affairs Erato Kozakou Marcoullis, Government Spokesman Stefanos Stefanou and Cyprus’ Permanent Representative to the UN Minas Hadjimichael. According to diplomatic sources, discussion was constructive and the five permanent members considered as interesting the position of President Christofias for joint exploitation – with the Turkish Cypriots – of natural resources after the solution of the Cyprus problem, as well as that any revenue from natural gas would benefit the Turkish Cypriot community even without a solution of the Cyprus problem.